I was looking forward to reading VELVET UNDERCOVER because I enjoyed Teri Brown's YA paranormal-historical series, Born of Illusion. I was looking forward to getting the same level of satisfaction I got from that unfortunately it wasn't as crisp as I hoped it would be. I liked the idea of a teen spy. There were a lot of women who helped the Allies win the war so Samantha was a plausible character. I liked the German setting and background, being inside enemy lines at such a tense time is nerve wracking! Samantha is just 17, recruited from Girl Guide directly, no experience to boast of. Germany is a big deal and I admire her gumption very much. I don't think I'd be able to sleep, eat, or breathe if it were me. I loved that there was no romance. Samantha had a thing with a dude named Maxwell, but it didn't really go beyond gingerbreads and a short conversation in the hallway. I loved that Samantha has her priorities straight and used logic over the pull of attraction she has with Maxwell. Outside the story, thanks TBrown for doing away with it, IMHO it wouldn't work well with the plot. I liked the twist on Velvet's identity. TBrown held on to that secret until the last minute and it was a good surprise. 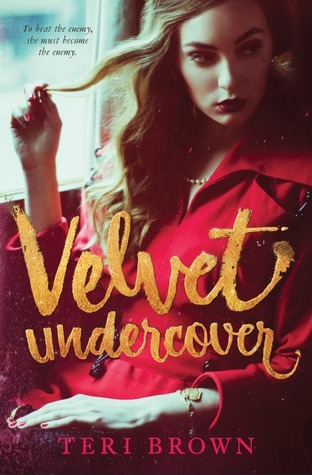 With all the spying and working undercover I found VELVET UNDERCOVER to be flat. It mysterious, but wasn't suspenseful as I expected it to be. I feel the story to be too calculated that it took away the character drive the blurb hinted on. The stunted setting played a big part IMHO and I wish it went beyond a few German phrases. Samantha is in Germany spying for the Allies in the midst of WWI! The atmosphere should be thick with tension even if Samantha was mostly inside palace walls. I would think the situation is more prevalent inside the Kaiser's adobe than anywhere else. Lastly, my first meeting with Samantha wasn't fantastic. I found her irritating at first, and for a top Girl Guide whose father is also a spy, some of her questions felt very uninformed like she came across like some girl MI5 picked up on the street versus a credible and viable candidate for the position. Overall, I liked the notion of giving interest to such a very important part of history. VELVET UNDERCOVER might not be a true story, but it can pique the interest of a young adult to research and know more about such a pivotal moment that changed the landscape of the world. I just felt like there were key elements missed that would've made the novel suspenseful of thrilling. Harriet The Spy is a better mole than Samantha Donaldson. Sounds a little disappointing... You're right, of course - against that backdrop, there should be tension galore. She was slipping into ENGLISH and she has a "weird" accent which would've made those around her suspicious. I can understand why a romance plot would not work with this book. And of course I love a teen spy book, too! It's a bummer that Velvet Undercover fell flat. :/ it has the makings of such a good book... Sigh. Hate when that happens! I was looking forward to reading this one, but hmm... I don't like that it's so flat. I mean it's a spy book! You HAVE to be having fun while reading it, not bored. I'm sad about the lack of romance too, but I guess I understand why it's a good thing. Sorry this fell flat for you in the suspense department. You are right though, a good mystery is always suspenseful as well. Maybe I am the wrong reader for it, maybe a younger reader will better appreciate the laid back story. Good point, Brandee! I love the premise, but struggle with the genre in YA. Great review Braine, i am sorry this fell flat for you. Nuts! I love the idea of spying and infiltrating during WWI, but I want the suspense, too. Still, think I'll give this one a go eventually. It definitely wasn't filled with tension, considering the war going on. Also, some of the tactics used when she was "training" were too short and not exciting. I did enjoy the ending though. It felt more like Girl Scouts than Girl Guide. I got super irritated when she was crying over losing that trophy to another girl. Then we see her "skills" and I understood why she lost. I kind of lost interest in this author, her first book didn't overly impress me. Too bad this one fell flat, it had a lot of potential. I liked that one, this one just tanked. Not really my kind of book and I've been reading mixed reviews but I love the spy angle! I guess I need to get a new spy book to read. Despite the problems, it still sounds like an interesting read. Not quite sure if it is for me as I'm not sure I would connect well with the heroine. I do like that she is a spy. It's hard to enjoy a book if you don't like the main character. A shame you didn't enjoy it as much as you hoped! With a teen spy, you would think it would be more suspenseful. Hmmm, I was on the "wall" about this one (get it? ha, lame!) and I have it so I probably will start it and see how it goes but I won't try and push it if it doesn't GRAB me. Thanks for the heads up!!! Great review! Aw damn, and the cover was so intriguing too! The blurb sounded intriguing, but it sounds like it doesn't fully live up to that. I do like the fact the main character has her priorities straight and doesn't focus on the romance, especially considering the whole situation she is in. You would think with all the spying going on it would be more suspensefull. Harriet the Spy, LOL! I would definitely need Samantha to demonstrate some more adept spying skills, especially since her father's already in the business. I think I'll pass on this one because my expectations for suspense would definitely be high, given the book's synopsis. Bummer. Sorry to hear it didn't live up to her other book. It does have a promising sound to it. Maybe the next book will pick up more? Good to know! I was going to read this one, but now I won't bother.